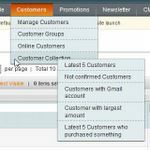 In this article I’ll give you some example how to get different collection of customers. For example, how to get latest 5 customers, unconfirmed customers, latest 5 customers who purchased something etc. I’ll create few objects that are instances of Mage_Customer_Model_Resource_Customer_Collection class and few objects that are instances of Inchoo_CustomerCollection_Model_Resource_Customer_Totals_Collection class. Class Inchoo_CustomerCollection_Model_Resource_Customer_Totals_Collection extends Mage_Reports_Model_Resource_Customer_Totals_Collection class. How to get Not confirmed customers? The last parameter of joinField is string which contain table, field and value “831”. Value “831” is ‘attribute_id’ from ‘eav_attribute’ table where ‘attribute_code’ is equal “confirmation”. How to get customers with Gmail account? How to get customer with the largest purchased amount? $collection is instance of Inchoo_CustomerCollection_Model_Resource_Customer_Totals_Collection. Methods: addTotalOrderAmount(), addBillingData() and addCustomerData() are declared in Inchoo_CustomerCollection_Model_Resource_Customer_Totals_Collection class. 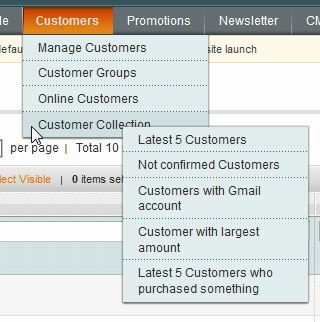 These collections of customers, You can see under Customer->Customer Collection. As you can see on the picture bellow, I decided to disable filtering options, sorting by column and Massaction Block. CustomerCollection extension is tested on Magento CE 1.6.1.0. You can download extension here. i tried this (magento 1.9.0.1) and get 404 whenever i load any of the collections as well. Any help on that? Nice post but if I use this the sql statement take long time to run approx 16-19 seconds. I have around 2 Lakhs customers. if I simply remove the filter then it takes only 0.0012 seconds. Why any Index needed. Please help me to run it faster. Not working on CE 1.9.2… I was expecting to see the not confirmed customers only!! Yes, I found it, but it was sort of a workaround. I extended the collection adding a method to do outer joins, but I haven’t the code anymore. And it didn’t play really well with all the magento filters and other features. Please, help me. I’m fighting with this since yesterday. I need to filter out the not confirmed customers. ->addAttributeToFilter(‘confirmation’, array(‘null’ => true)) doesn’t work. I understand that the problem is that addAttributeToFilter does a inner join, and I need an outer join. As far as I can tell is impossible to do (natively) an outer join in Magento. is not include discount from price. how to fix it. After installation of your module I get 404 page too, what is wrong ? Is this extension work on Magento 1.5.x ? thanks but when I click on customer menus it returns to page 404 . can you help me? instead of ->joinField(‘notconfirmed’, …) in the first example.